Hackers stole approximately 500K from the city of Tallahassee, Florida, by diverting city employees’ paychecks, according to USA Today. The attackers hacked a third-party vendor that provides the city’s payroll services, and then redirected direct deposit payments to attacker-controlled accounts. You try to protect your organization the best you can, but you’re being pulled in a million directions, attempting to secure every possible attack vector. The problem is that cybercriminals are constantly evolving their tradecraft, becoming more daring, sophisticated, and successful at cyberattacks and making it increasingly difficult for IT to keep the bad guys out. 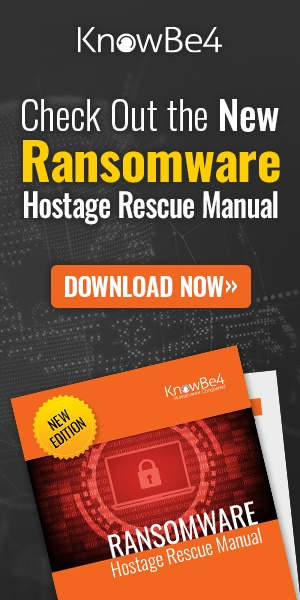 In this highly informative webcast, join cybersecurity expert and Microsoft MVP, Nick Cavalancia, and Erich Kron, KnowBe4's Security Awareness Advocate, as they discuss the results of KnowBe4’s 2019 What Keeps You up at Night Report. The pressure to divest comes as Washington increases scrutiny on foreign ownership of U.S. technology companies, including by China, and is paying closer attention to deals that could compromise the personal data of U.S. citizens. The U.S. intelligence community’s 2019 Worldwide Threat Assessment report cited Russia’s efforts to interfere in the U.S. political system. Pamplona bought a minority stake in Cofense, which serves major corporations, in February 2018, when the company was known as PhishMe. Pamplona’s funds been partly backed by Russian billionaire Mikhail Fridman, who was on a February 2018 “oligarchs’ list” published by the U.S. Treasury Department, sources familiar with the matter said. Are your users' passwords…P@ssw0rd? Verizon's Data Breach Report showed that 81% of hacking-related breaches used either stolen and/or weak passwords. Employees are the weakest link in your network security. FireEye recently reiterated their analysis that 1 out of 101 emails are malicious and email continues to be the #1 threat vector for cyber attacks: FireEye continues to detect an average of over 14,000 emails with malicious attachments or URLs per customer per month that get past the filters." That's really big numbers! Remember the famous Bruce Schneier quote: “Security is a process not a product.” Part of that process is creating and maintaining a human firewall to manage the ongoing problem of social engineering. Your users are likely already reporting potentially dangerous emails in some fashion within your organization. The increase of this email traffic... can present a new problem! With only approximately 1 in 10 user-reported emails being verified as actually malicious, how do you handle the real phishing attacks and email threats —and just as importantly— effectively manage the other 90% of user-reported messages accurately and efficiently? Now you can with PhishER, a new product which allows your Incident Response team to quickly identify and respond to email threats faster. This will save them so much time! See how you can best manage your user-reported messages. Easy integration with KnowBe4’s email add-in button, Phish Alert, or forwarding to a mailbox works too! Find out how adding PhishER can be a huge time-saver for your Incident Response team. The treasurer of the city of Ottawa, Marian Simulik, fell for a business email compromise (BEC) scam and sent 100K to a scammer, the city’s auditor general revealed this week. Simulik received an email last July from a fraudster posing as the city manager. Simulik realized her error several days later, when she received another bogus request for 150K. This email arrived when she was at a council meeting with the city manager, so she asked him personally about the request. The manager knew nothing about the matter, and Simulik told him about the money transfer that took place days earlier. Simulik was apparently mortified that she fell for the scam. "That I should be the target and victim of this sophisticated attack has affected me deeply both professionally and personally," she said. "Hi Stu, My apologies for the delay in responding to this email. I have a small team and wear many hats. We are thrilled with the KnowBe4 product. We have completed our baseline phishing campaign and a second one. Our phish-prone percentage dropped from 24.3% to 6.8% after only one campaign. More importantly, we had a good percentage of our users report the email through the Phish Alert button. We have sent out an initial security awareness training campaign with two videos and roughly 90% of our staff has watched them. We also sent out two additional training campaigns for one-time and multiple time clickers. The feedback has been overwhelmingly positive around the training. Episode 9 Title just came out: "Star Wars: The Rise of Skywalker" New Trailer! FAVE for the kids. 'The Lion King (2019)' by Disney utilizes pioneering film-making techniques to bring treasured characters to life in a whole new way.